Packaged in a cardboard gatefold with the cassette snapcase glued to the right inner side along with a mini-harmonica. 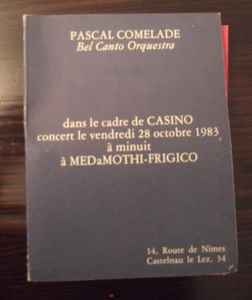 "dans le cadre de CASINO, concert le vendredi 28 octobre 1983 à minuit à MEDaMOTHI-FRIGICO. Originally released as tape on Medamothi / Frigico in 1983 and as part of Pascal Comelade - Milano Enarmonisto on ADN in 1984. This edition comes with a toy mini harmonica attached to the inner cardboard.